Following on from our last article on “Why would you buy a Triathlon Wetsuit for Triathlons" today I want to discuss the fit and actually trying on a wetsuit. This may seem obvious but how to pick a triathlon wetsuit mainly comes down to one important thing which is its fit. Wetsuits must be well fitted, as tight as possible before feeling restrictive; shoulder rotation is the single most important aspect of body and wetsuit movement. Your budget should not restrict the most important part of buying a wetsuit and that is getting the right fit/size. If a wetsuit is too big/loose, once in the water and you start to swim the suit will fill with water and instantly affect all the benefits you gain by wearing a wetsuit (warmth, buoyancy, efficiency and speed). If water can flush through the suit you lose any real thermal benefits as fresh, cold water will keep moving against your skin. If water cannot flush through, it will gather in your wetsuit and affect your buoyancy, body position in the water (1Litre of water weighs 1kg) and in turn this will affect your efficiency and speed through the water. When putting on a triathlon wetsuit for the first time could be embarrassing and stressful, you may even perspire and need help, with all these possible problems, remember the wetsuit has to feel like a second skin and this is precisely why they are so effective in the water. Most brands have available full range of sizes. These size charts offered by each wetsuit brand are intended as a guide only everybody has a different shape and size. Each brand and model will be ‘cut’ differently and with all of us being extremely varied in our shapes, some models will suit a particular build better than others. This simply emphasizes the need and importance of trying wetsuits on before purchasing. As mentioned before a well-fitted wetsuit should feel like a second skin. It should be tight without being restrictive and without any folds or excess fabric. When trying on a wetsuit, it’s important eliminate any excess fabric as you move up the body. Put your wetsuit on dry. Roll the wetsuit inside out down to knee position. Start by placing one foot in the leg and ease your feet through until they pop out the end of the wetsuit leg. Depending on how long your legs are you will show 1-15cm of skin above your ankle. This can be aided by wearing small plastic bags on your feet, which can help to get the suit over your feet. Repeat the sequence with the other leg. Starting at the ankles, pull up/unroll the wetsuit up your legs, eliminating any folds, ripples in the suit. Continue to work the legs up until the crotch is as high as it can go. At this point the non-fitted part of the wetsuit should be above your hips/waist. Repeat the process similar to the legs for the arms. Initially just do one arm at a time. As the wetsuit reaches your armpit there should not be any extra fabric, it should be a snug fit. With the legs and arms in the wetsuit, zip up the suit, assistance maybe required with the zipping and closure of any Velcro fastening. When doing up the zip make sure the inner flap along the zipper is not bunching up or folded over. Once you have your wetsuit on, apply some lubricant around the neck and ankle/calves when competing. 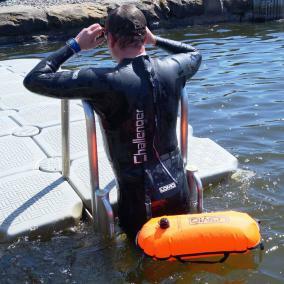 Helps/speeds up the removal of the wetsuit in transition after the swim. NEVER use petroleum based Vaseline or oils to lubricate these areas always use specialist lubricant. Any ripples left in the stomach/chest area need to be smoothed out by hoisting the neoprene upwards towards your shoulders. The important thing is that you should be able to go through the motion of swimming relatively easily on land. A warning about wetsuit neoprene: Many of the wetsuits are made with a higher grade of smooth-skin rubber. This material is light, very buoyant and flexible, and often has a surface treatment called Super Composite Skin (SCS) that makes you hydrodynamic in the water. The down-side to this amazing material is that it's very delicate. It is particularly susceptible to finger-nail cuts and other abrasions. You need to always be very careful when trying on, and putting on wetsuits made from this kind of rubber. To avoid nail marks and other damage, a helpful hint is to wear gloves- lightweight cotton or disposable rubber gloves work well.